A 2" super clear, twinned, multi-penetrated doubly-terminated crystal draws your eye across several sets of spray formations featuring rare needle-sized to sleek pendant-sized crystals. Grown over a sparkling, drusy covered triangular sandstone matrix, this Arkansas cluster is 3 1/4x 3 1/2x 1 1/4". 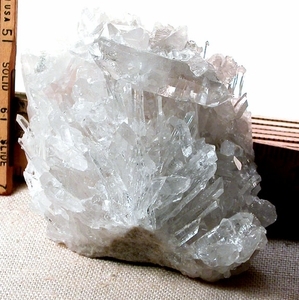 Given the delicacy of this formation several crystals are incomplete, however; aesthetics, motion, clarity, rainbows and the power of this quartz group will inspire you.